While visiting Grandma and Grandpa Rose, the four Chases took a day trip down to Pismo Beach for a little shopping at the Bass Outlet. We also packed the swim suits and found a little stretch of sand to let the boys play. It was a wonderful break from the high heat back at the ranch. 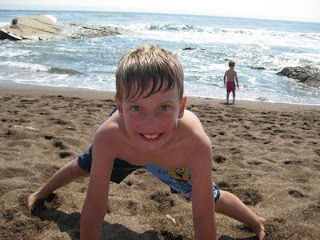 Ben collected pebbles and rocks to toss into the waves and Nathan yelled into the surf while Daddy stood nearby. Mommy just kept slathering on the sunscreen and taking photos until everyone was tired and hungry enough for the BBQ Grandpa had grilling back at home.